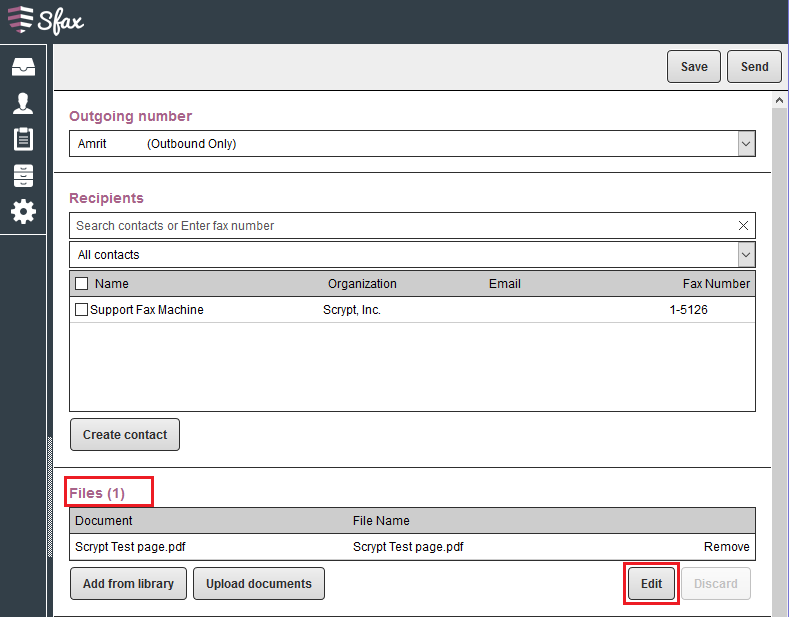 If you are using the web portal to prepare your fax and would like to add annotations you will first need to upload your document in the Files section and then select the Edit option. After selecting edit you will be taken to your document where you can then begin to add annotations. If you are using Sfax for Windows or Sfax for Mac (Maverick, & Yosemite OS only) you will first send the document to the virtual printer (Sfax Driver) which will then upload the document to prepare for faxing. 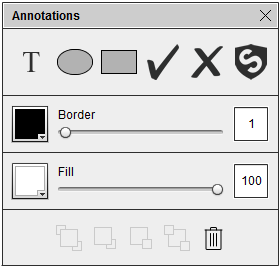 Once the program launches you will have the ability to select the Show annotations icon as described below. 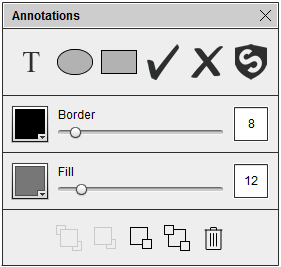 To add annotations or digital signatures to your document you will need to select the page of your document that you would like to work with and then select the Show Annotations icon. 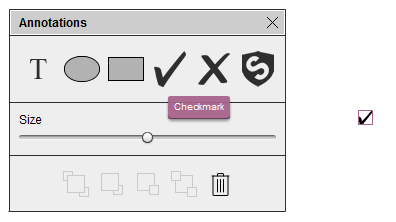 Once you select the Show Annotations icon the annotations box will display. This is where you will select from the various options. The options available are Text, Ellipse, Rectangle, Check mark, Cross, and Digital Signature. To use one of the options you will need to grab the option and drag it onto your document where you would like to apply the option. 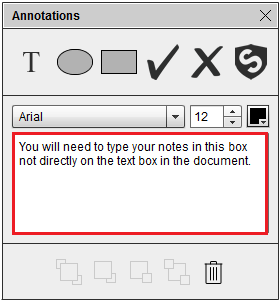 Once you drop this on the document you will see the options of the annotation that you selected. To add text to your document drag the onto your document and this will then launch the Text options. After you make your font selection you have the ability to select font size (8pt – 96pt) as well as the gray scale of the font. To add an ellipse to your document drag the onto your document and this will then launch the ellipse options. The options presented are to adjust the Border and Fill. 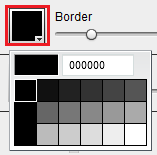 The Border adjust scale is 0 – 100 and can be adjusted by using the slider or by typing into the number field. 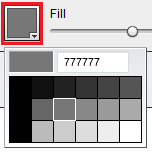 You can adjust the gray scale by selecting the button next to the slider bar and then can select from the gray scale options. 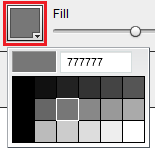 The Fill adjust scale is 0 – 100 and can be adjusted by using the slider or by typing into the number field. 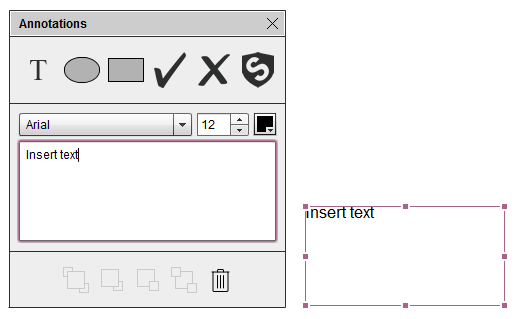 When adjusting the Boarder and Fill of the ellipse you can highlight text or areas of your document. See example. 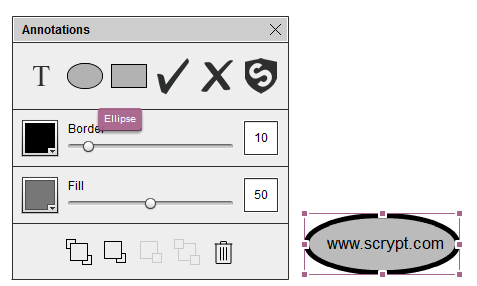 You can remove the ellipse by select the remove icon. To add a rectangle to your document drag the onto your document and this will then launch the rectangle options. When adjusting the Boarder and Fill of the rectangle you can highlight text or areas of your document. See example. 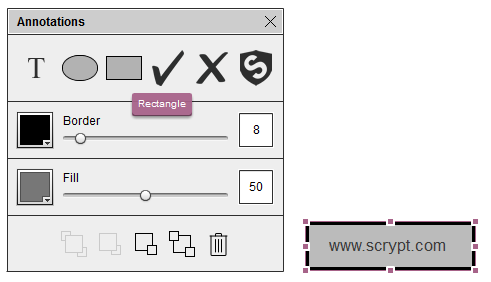 You can remove the rectangle by select the remove icon. To add a check to your document drag the onto your document and this will then launch the check options. To add a cross to your document drag the onto your document and this will then launch the cross options.